Annually since the early 1980s, the S.C. Department of Natural Resources (SCDNR) conducts a Summer Turkey Survey to estimate reproduction and recruitment of wild turkeys in South Carolina. The survey involves agency wildlife biologists, technicians and conservation officers, as well as many volunteers from other natural resource agencies and the general public. Although South Carolina wild turkeys nest primarily in April and May, the survey does not take place until late summer, according to Jay Cantrell, SCDNR Assistant Big Game Program Coordinator. Therefore, the survey statistics document poults (young turkeys) that actually survived and entered the fall population. "Reproduction in turkeys has generally been low for the last decade", Cantrell said. "This year, average brood size of 3.8 poults remained good, but the total recruitment ratio was 1.8, a less than desirable figure but an improvement over the previous three years." This low figure was driven by a high percentage of hens (53%) that had no poults at all by late summer. Just as the total recruitment ratio showed small signs of improvement, the percentage of hens without poults statistic was the best it has been since 2011. Recruitment ratio has averaged 1.6 over the last 5 years, keep in mind that 2.0 is somewhat of a break even mark. In fact, when turkey populations were expanding during the 1980's recruitment ratio averaged 3.5. Recruitment ratio is a measure of young entering the population based on the number of hens in the population. "It is basically a good news, bad news kind of year" Cantrell stated. "Reproduction was poor in most of the state and definitely lower than we would like to see, but numbers are better than the last few years. Although statewide numbers were less than favorable, the Southern Coastal Plain region did show signs of good reproduction with a recruitment ratio of 2.2, an average brood size of 4 and only 44% of hens without poults. Things are improving, but we're not back where we need to be to see widespread improvement in the turkey population in South Carolina." Unlike deer, wild turkeys are much more susceptible to significant fluctuations in reproduction and recruitment. Lack of reproductive success is often associated with bad weather (cold and wet) during nesting and brood rearing season. However, there are a host of predators that take advantage of turkey nests and broods including; raccoons, opossums, snakes, foxes, bobcats, and numerous avian predators. Coyotes, which are not native but are now well established in the state, can be added to the list of turkey predators. Turkeys naturally have high reproductive potential and are therefore able to maintain populations in spite of predation and other mortality factors. The problem is that we have not been getting much bounceback amid years of poor recruitment. 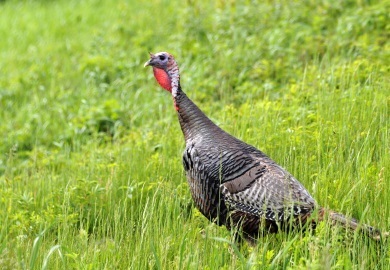 What does reproduction last summer mean for the spring turkey hunter? "Spring harvest trends have followed trends in reproduction for many years," Cantrell indicated. "For example, the harvest in 2015 was down significantly which was not a surprise because reproduction in 2013 was the lowest on record. The 2016 spring harvest showed a 10 percent increase in harvest over 2015. Just as the reduced harvest in 2015 was explained by the all-time low reproduction in 2013, the increase in harvest seen in 2016 was likely a result of slightly better reproduction in both 2014 and 2015 which lead to an increase in turkey numbers in many parts of the state." However, in spite of the increase, in 2016 harvest levels remain 34 percent below the record harvest established in 2002. The association between changes in reproduction and its effects on harvest are rather remarkable in South Carolina's turkey harvest and reproductive data sets. Based on this information, Cantrell says we can expect to see another slight increase in the harvest in the spring of 2017. Finally, the gobbler to hen ratio during last summer's survey was 0.48, which is the lowest since the year 2000. Low gobbler-to-hen ratios can affect the quality of hunting because hens are extremely available, which affects gobbling and responsiveness to calling by hunters. "The bottom line," Cantrell pointed out, "is the state's turkey population is about 35 percent below record levels that we saw 15 years ago. This year showed a slight uptick over the last three years, but additional improvements and better reproduction for several years is needed to get the population back up. That is the nice thing about turkeys though; given the right conditions they can naturally bounce back in a short period of time." Anyone interested in participating in the annual Summer Turkey Survey is encouraged to sign-up. The survey period is July 1 through August 29 annually, and those who participate typically spend a reasonable amount of time outdoors during that time period. Cooperators must be able to identify wild turkeys and must be comfortable in telling the difference between hens, poults, and gobblers. If you would like to participate in the survey, contact Jay Cantrell at CantrellJ@dnr.sc.gov. You will be added to the cooperator list and receive materials at the end of June annually. Those interested in the survey can also download instructions and survey forms here.